This spring I received an invitation to travel to New England and present some of my research on Hartford, CT as a Place of Invention. On May 15, 2015, about 70 local history enthusiasts participated in the Precision Valley Symposium, which explored the past, present, and future of local manufacturing industries along the Connecticut River valley in upstate Connecticut and western Massachusetts. The symposium was hosted by Superintendent James Woolsey and historian Richard Colton from the National Park Service’s Springfield Armory National Historic Site, and Dean Arlene Rodriguez of Springfield Technical Community College, which operates from the buildings and grounds of the decommissioned federal armory. I packed a lot of sightseeing into this two-day trip! After landing at Hartford’s Bradley Airport on May 14, I pulled the rental car onto Interstate-91 and drove alongside the beautiful Connecticut River as I traveled the 25 miles north to Springfield. It was too early to check into the hotel, so I grabbed lunch and headed straight for the Naismith Memorial Basketball Hall of Fame. James Naismith invented the game of basketball in 1891 while working at Springfield’s YMCA International Training School (today, Springfield College). He was looking for a recreational activity that rowdy young men could play indoors during the bracing New England winters. He hung peach baskets along the 10-foot high balcony of the gymnasium; the goal was to shoot a soccer ball into the baskets. After nearly 125 years, basketball remains one of the most popular sports around the world. I have played and followed basketball all of my life, so it was a thrill to learn more about the rich history of the game and to see artifacts from some of my heroes, including Larry Bird, Magic Johnson, and Michael Jordan. Left to right, jerseys and shoes from Hall of Famer, Wilt Chamberlain (#13), Larry Bird (#33), Ervin “Magic” Johnson (#32) and Michael Jordan (#23), at the Naismith Memorial Basketball Hall of Fame in Springfield, MA. Photo by Eric Hintz. I woke the next day and headed to the symposium; the morning session included three historic talks. The first talk, by MIT’s Merritt Roe Smith described the history and influence of the Springfield Armory. During the Revolutionary War, General George Washington selected the Springfield site to serve (along with Harpers Ferry, Virginia) as one of two arsenals for the United States Army. Over the next 200 years, the Springfield Armory became “The Forge of Innovation,” as its expert arms makers perfected the techniques for precision manufacturing with interchangeable parts. The Armory actively served the United States Army until it was de-commissioned in 1968. MIT’s Merritt Roe Smith describes the history and influence of the Springfield Armory during the Precision Valley Symposium. Photo by Bill Hosley. In my talk, I described how the “American System” of manufacturing perfected at the Springfield Armory spread down river to Hartford. The Springfield and Harper’s Ferry armories supplemented their output by granting contracts to private sector arms makers such as Hartford’s Samuel Colt, Christian Sharps, and Christopher Spencer. These contracts stipulated that all new arms be made with uniform parts, so the precision manufacturing techniques became more widely adopted outside the federal armories. 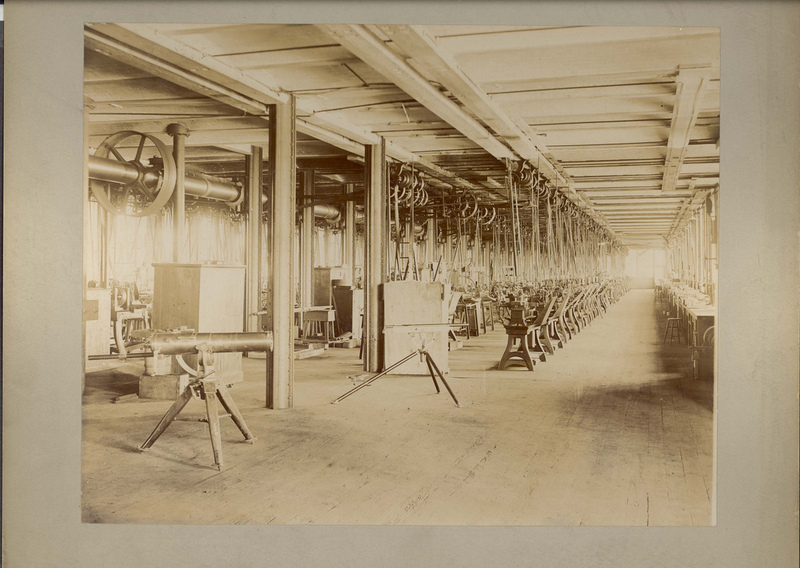 Then, during the late 1800s, Hartford’s talented machinists carried “armory practice” into all kinds of metal-working industries, as the city became a hub for the manufacture of sewing machines, bicycles, automobiles, and typewriters. 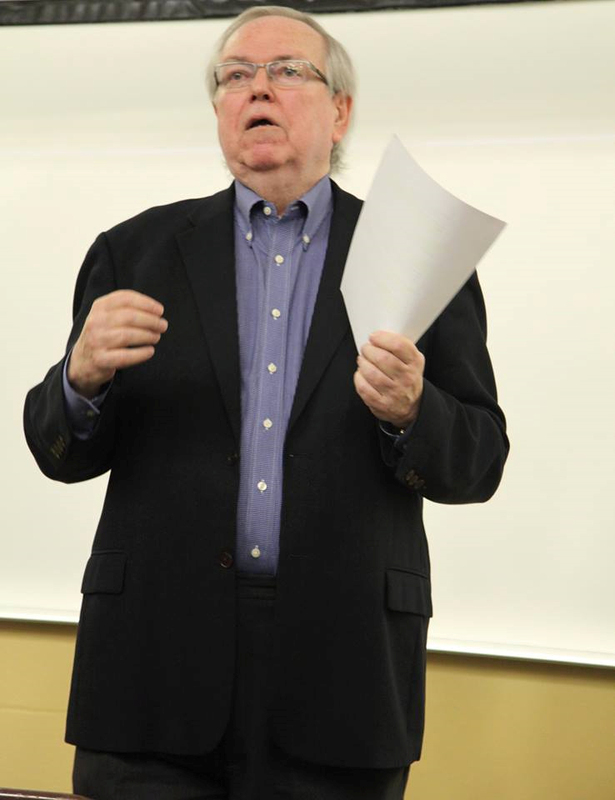 Finally, labor historian Robert Forrant of UMass-Lowell described the deindustrialization of the “Precision Valley” after World War II as local manufacturers began downsizing their operations or moving them to cheaper labor markets overseas. Springfield and the surrounding area have struggled to recover from the huge job losses and vacant, deteriorating factories. In the midst of this economic upheaval, the Springfield Armory was decommissioned. One of the main buildings was converted into the National Park Service’s museum and visitor’s center; the rest of the buildings were turned over to the newly established Springfield Technical Community College. With that historical backdrop in mind, the early afternoon sessions focused on current efforts to revitalize manufacturing in the region. Dave Cruise, President and CEO of the Regional Employment Board of Hampden County, spoke about STCC’s efforts to train local students in computer-aided design (CAD) and “additive manufacturing” (3-D printing). Finally, we concluded the symposium with a panel discussion moderated by Dean Rodriguez. The Visitor’s Center of the Springfield Armory National Historic Site, which is now part of the campus of Springfield Technical Community College. Photo by Eric Hintz. After lunch, the symposium attendees broke into three groups for local tours. The first group received a behind the scenes tour at the Springfield Armory National Historic Site, which houses the world's largest collection of historic American military firearms. A second group toured the factories of Smith & Wesson, which has been making firearms in and around Springfield since 1852. My group drove south to Hartford to tour “Coltsville,” site of Samuel Colt’s Armory and mill village. Two of our tour guides were James Woolsey (left) and Jack Hale (right). James is pulling double duty as superintendent of both the Springfield Armory National Historic Site and the newly created Coltsville National Park. Jack is senior warden of the Episcopal Church of the Good Shepherd, built in honor of Samuel Colt by his widow Elizabeth, and now part of the Coltsville National Park. Photo by Eric Hintz. Samuel Colt constructed his magnificent armory in 1855, and for generations it produced firearms for the United States military branches, police departments, and sportsmen around the world. After Colt moved it operations to West Hartford in 1994, the original onion-domed factory sat empty for several years as government official searched for a redevelopment partner and lobbied Congress to designate the site as a historic site. The Colt Armory’s refurbished star-spangled, blue onion dome, topped by a rampant colt. Photo by Eric Hintz. In 2010—after a few false starts by other developers—CG Management took over redevelopment of the historic Colt Armory site. With financial backing from Chevron Tax Credit Investments (an arm of the oil giant), CG managing director Larry Dooley and his team set about renovating the South Armory into a mixed use building that’s now home to the Colt Gateway loft apartments, the Colt Café, and a pre-school! CG is currently making plans to renovate the East Armory for commercial tenants. Our third tour guide was Larry Dooley, general manager of CG Management (middle right, left hand in pocket). Larry took us up inside the onion dome atop the East Armory; Interstate-91 and the Connecticut River are in the background. Photo by Eric Hintz. Colt’s South Armory, recently renovated and now home to the Colt Gateway apartments, the Colt Café, and a preschool. Photo by Eric Hintz. In December 2014, after years of lobbying by Hartford’s city leaders, Congress and the Department of the Interior approved plans to turn the Colt Armory and surrounding area into the 260-acre Coltsville National Park. Plans for the historical park include a 10,000-square-foot visitor center in what used to serve as the Colt foundry and forging area. Inside the future home of the Coltsville National Park visitor’s center. This building used to house the Colt foundry. Photo by Eric Hintz. Having studied the Springfield Armory and Colt Armory in my research, it was thrilling to literally follow in the footsteps of the machinists I’d seen in historic renderings and photographs, some more than 100 years old. Thanks to public-private partnerships in Springfield and Hartford, millions of future visitors to the Springfield Armory and Coltsville historic sites will get to experience that same thrill! Inside Colt’s East Armory, circa 1890. Courtesy of the CT State Library. Inside Colt’s East Armory, 2015. Photo by Eric Hintz. Colt Manufacturing Company LLC. “History,” http://www.colt.com/Company/History.aspx, viewed 6 August 2015. Hladky, Gregory B. “Coltsville National Historical Park Wins Final Approval,” Hartford Courant, 13 December 2014, http://www.courant.com/news/connecticut/hc-coltsville-what-next-20141212-story.html#page=1, viewed 6 August 2015. McCuaig, Donald S. “Basketball: A YMCA Invention,” http://www.ymca.int/who-we-are/history/basketball-a-ymca-invention/, viewed 6 August 2015. McGarry, Mike. “Colt Gateway,” The Hartford News, 29 August 2013. Reprinted at HartfordInfo.org, http://www.hartfordinfo.org/issues/documents/economicdevelopment/htfd_news_082913.asp, viewed 6 August 2015. Smith & Wesson. “Smith & Wesson History,” http://www.smith-wesson.com/webapp/wcs/stores/servlet/Category4_750001_750051_757941_-1_757938_757812_image, viewed 6 August 2015. Springfield Armory National Historic Site. “History & Culture,” http://www.nps.gov/spar/learn/historyculture/index.htm, viewed 6 August 2015. Springfield College. “Springfield College: The Birthplace of Basketball,” http://www.springfieldcollege.edu/welcome/birthplace-of-basketball, viewed 6 August 2015. Springfield Technical Community College. “About STCC,” http://www.stcc.edu/aboutstcc/, viewed 6 August 2015.